This is another guest review from Thomas Parsons. Thanks again Thomas for the review! Remakes are a touchy subject for todays cinematic connoisseur. If you direct a really good one and it’s popular (THE HILLS HAVE EYES 2006, DAWN OF THE DEAD 2004, THE TEXAS CHAINSAW MASSACRE 2003, etc. ), audiences will fondly remember it whenever they’re referring to the original film. Weather or not it tops the original version is irrelevant because the remake did the older one justice. If you direct a really bad one and people hate it (PSYCHO 1998, THE FOG 2005, PROM NIGHT 2008, etc. ), critics and fans will be scarred for life. Whenever the topic of the original movie comes up, someone will always mention the fact that there was an awful remake made years later. Like an uninvited guest at a party, these remakes get in the way of any fun and end up annoying everybody in the process. It’s the “kiss of death” and a curse of sorts for both films at steak. In a lot of ways, the prospect of a remake could put everything at risk for the current version and it’s originator. The sad part about this concept is how modern society perceives the idea of a “remake” today. As if it’s some kind of new offense in the world of cinema. Remakes have been happening ever since film directors could get behind the camera lens. Which is to say a very long time! Research online has shown me that remakes have been happening as early as the 1930’s! So it’s not a new concept. These days (2011) it seems like all Hollywood can do is churn out non stop remakes or “reimaginings.” No genre has been untouched by this trend, ranging from Horror to Science Fiction. It’s happening so much now, Hollywood has been labeled as “running out of ideas” in terms of stories. Which is sad if you ask me because the idea of a remake (especially during the mid 2000’s Horror resurgence) wasn’t necessarily a bad one. On a rare occasion, an original movie may have been awful in the first place (Wes Craven’s THE HILLS HAVE EYES 1977 for example) and a remake could be just what the doctor ordered! However, with every successful remake, film producers will always try and cash in on a fast buck. What started out in the mid 2000’s as a wonderful return for Horror (thanks in part to some well done remakes and creative new directors), quickly became over done and unnecessary. Mainly due to greedy movie producers trying to “milk the remake cow.” Part of it comes down to laziness (nobody has to write anything if the story structure is already there) and film producers never have to worry about writers striking ever again. In todays economy, the idea of a remake must look very good to these rich, bloated, fat cat, movie producers. With all that being said, remakes weren’t always a dirty word. The year 1982 brought us the amazing reimagining of THE THING. John Carpenter did a rare thing by out doing the 1950’s version hands down! David Cronenberg gave us THE FLY remake in 1986, doing itself and the original film justice. Many years down the road, new (and younger) directors would be adding their own personal stamps on movie reimaginings. Alexandre Aja would grace the world of Horror with his amazing remake of THE HILLS HAVE EYES in 2006. His version would help kick down the door to “retro throwback” Horror in the mid 2000’s. At that point, remakes hadn’t become over done in Hollywood yet, and it was quite refreshing to see Horror films making a serious come back. These new brutal remakes were fitting in nicely next to movies like SAW and HOSTEL. If you ask me, it was a very good time period! So where does this 1988 version of THE BLOB fit in? In short, it’s one of the best remakes out there! I can remember watching cartoons with my younger Brother on TV after school (THUNDERCATS to be precise) and while channel surfing, we caught a trailer for the latest remake film THE BLOB. In the preview, the audience watched as a man got sucked down a sink drain by the blob creature! It was a very effective movie trailer, always sticking around in the back of my mind for many years. As a matter of fact, I still think about that film preview to this very day! It was hip, dark and haunting all at the same time. In other words, it was THE BLOB for the 1980’s generation! It worked and the movie is still great today. Plot wise, the 1988 remake is pretty much the same as the 1950’s version. So I won’t bore you to death with a long winded film synopsis here. Just a quick run down. Basically a shapeless alien creature called “The Blob” crashes to earth in a meteorite. This slime like monster breaks out of it’s rock shell and attaches itself to a local homeless man who witnessed it crash to Earth. The Blob absorbs this guy, becoming much bigger in the process. The rest of the movie has The Blob terrorizing a local town by eating people and getting larger each time. It’s a simple story that is effective in 1988 as it was in 1958. There’s a few new twists for the 1980’s remake, but nothing to ruin the over all plot. If anything, they add to the story and make it even better! What makes this remake work so well is the wonderful production, great actors, brooding music and terrific cinematography. There’s a pre SAW fame Shawnee Smith (always looking great!) playing one of the leads here. Also, the director of this remake (Chuck Russell) is the master mind behind the amazing A NIGHTMARE ON ELM STREET 3 : THE DREAM WARRIORS. There’s a lot going on for this remake if you ask me. Gore Hounds, without a doubt, check it out! If you’ve never seen this version of THE BLOB, you’re in for a treat! The special effects are amazing! Most of The Blob itself is “old school” hands on latex effects. Sometimes it has the form of actual slime, other times it seems like it can make itself into something with a little stronger substance. This works in the creature’s favor because this version of The Blob can pounce on it’s prey like an animal! The special effects range from camera tricks, latex models, puppetry and blue screen tactics. All classic if you ask me! The death sequences are bloody, gross and all around disgusting! People are sucked into The Blob, melted by it’s corrosive acid and distorted in flesh stretching ways! This remake is deadly serious! 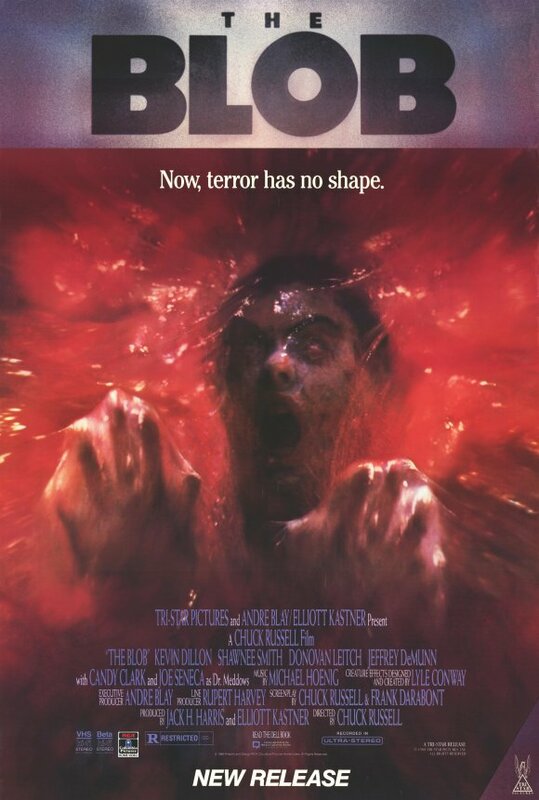 Over all, THE BLOB (1988) is one of the better remakes out there. It’s proof positive that a new version of a movie can be on the same level as the original. I get the feeling that people who grew up with the 1950’s version of THE BLOB will be put off by the more gory execution here. Not to mention all of the 1980’s styles. For someone like myself who grew up in the 80’s, this is a wonderful version of THE BLOB. Respectful to the source material, while adding it’s own personal touch into the mix. This is THE BLOB, done “old school” 80’s style! Most remakes wish they were this good!